Red pasta sauce is, for some, a tradition and staple in their homes. Our Grandparents would spend hours upon hours on their homemade pasta sauces. The house would be filled with the smells of simmering garlic, onions, tomato paste, and their "secret ingredient." Now, it's time to replicate their recipes. However, with most companies publishing the output, it is hard to know which cooktop simmers the best. We will look at the top brands: BlueStar, Miele, Wolf, Gaggenau, and Thermador, for their simmering capabilities. But first, let's review what simmering is. Simmering is cooking just below the boiling point. For everyday cooking, simmering is useful for thickening pasta sauces, gravy, or melting chocolate or cheese. It's cooking low and slow without burning. Some gas cooktops have dedicated burners for simmering, but others can simmer on any burner. This could be an issue when simmering on more than two burners at one time. BlueStar is a line produced by Prizer-Painter Stove Works Inc, a Pennsylvania based company and range manufacturer since the 1880s. They added cooktops to their line of products in 2006 and has since produced a line of high-quality cooktops, including a 36-inch cooktop which features a customizable stainless-steel design and knobs. You can choose from 750 different colors for the knobs if you don’t want stainless steel. They are the most powerful in cooktops with two burners up to 22,000 BTUs, two burners with 8,500 BTUs and one 9,000 simmer burner in the back-right corner that can simmer as low as 130 degrees. This open burner cooktop has cast iron burners with flames that point up for ideal direct heat. Most cooktops have an angled flame, which causes you to lose heat. 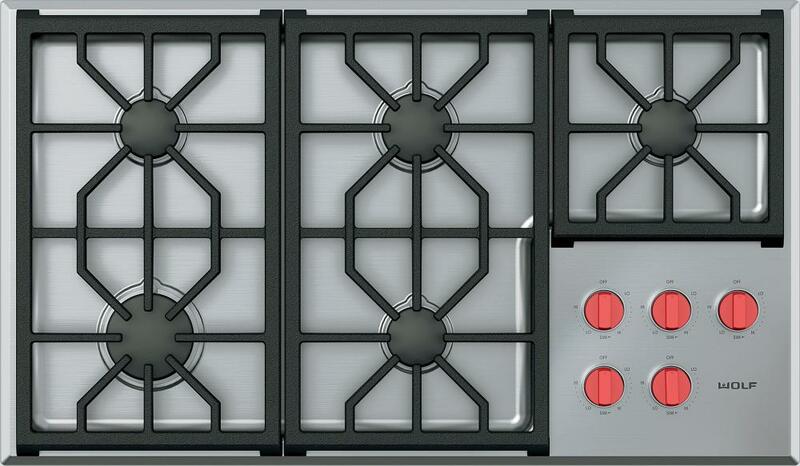 The above Miele 36-inch-wide KM2355 gas cooktop is $1,899. They manufacture their own parts as oppose to outsourcing, resulting in a higher quality and more reliable product. 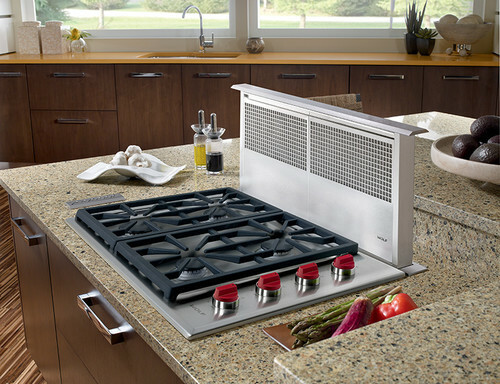 Their almost flush mount gas cooktops feature a stainless-steel finish and a total of five burners with up to 15,000 BTUs. The front left burner is 3,900 BTU’s for a low 650 BTU simmer. The big center burner can also simmer as one can use just the small center burner for simmering at 700 BTU. This is one of the most flush gas cooktops on the market when installed, which is a nice alternative to the traditional bulky look of most gas cooktops. The 36-inch cooktops come in a stainless-steel design with control knobs and double stacked sealed burners that allow for maximum performance at both high and low output/control. All five burners of the cooktop are dual stacked or can all simmer. Dual stacked means the burners have two separate flames. When you simmer, just the bottom half is activated. The advantage is not only 5 burners capable of simmering, but also variable simmer allowing you to do a high, medium, or low simmer on each burner. The Gaggenau VG295214CA gas cooktop is priced at $2,899. This second German brand on the list is also a high-end appliance maker with several awards and is one of the top leading brands in the industry. 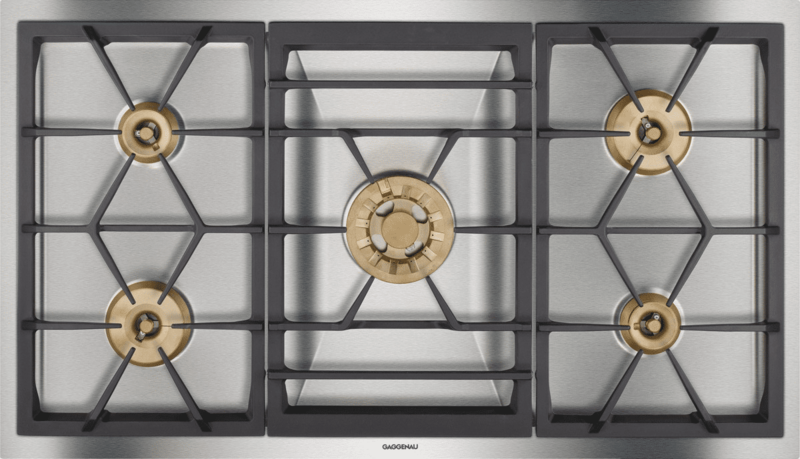 This gas cooktop, like other Gaggenau products, features beautiful and unique designs and has up to 58,000 BTUs total. All burners on this cooktop are also simmering burners featuring electronic flame monitoring and automatic re-ignition. All of the burners have inner and outer flames similar to Wolf so that just the inner burners are active when simmering at the lowest settings. With the flame being so small at that point, it is nice to have automatic re-ignition just in case the burners blow out. Over my 18 years selling appliances, I have noticed that the average Gaggenau replacement is 20-25 years. It is one of the most reliable appliances sold at Yale. The Thermador 36-inch Masterpiece Series SGSX365FS cooktop for $1,899 is the most popular. 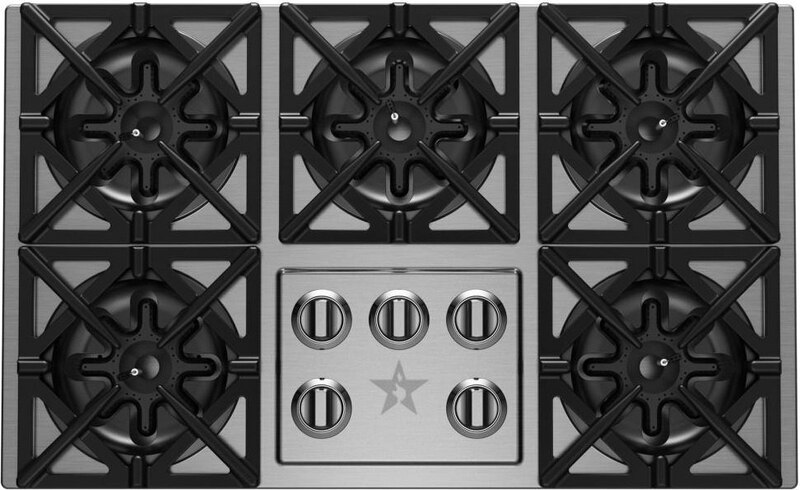 Thermador has one of the most unique features for a cooktop on the market: the star burner for the best and most even spread of heat. Their flame heats the inside and outside of the pan to cook more evenly and efficiently. There are 5-star burners on the 36-inch Masterpiece Series and it can deliver up to 18,000 BTUs of burning power. It also has two simmer burners of two sizes (large and small) for a wider range of pans. Unlike the others, Thermador has 2 burners cycling on and off for the lowest simmer down to 200 BTUs. You melt a bar of chocolate, and it will retain its shape with a simmer this low. Thermador is also the pioneer in package pricing which is also one of the factors in its popularity. I think that this layout is also popular because it results in more cooking surface than the other brands and layouts. To summarize, BlueStar has one simmer burner that will not be quite as low as some of these other burners in BTUs but is spread out to get to that low 130 degrees. Jenn-Air is similar and therefore gives you a larger burner lid for simmering on their smallest burner to spread the flame more to get lower heat. Wolf and Gaggenau can simmer on all of their burners using a two-stage system. (You can simmer by shutting off one of the stages.) Thermador is very good as it can average the lowest mean temperature for longer-term simmering. It all depends on how you cook and how often you may need to simmer. So, go forth, and replicate that homemade sauce recipe! Download the Yale Pro Cooking Buyers Guide with features, specs, and tips on buying the right cooking product. Well over 240,000 people have read a Yale Guide.